Can you believe that we’re three quarters of the way through January already? It feels like only yesterday we were welcoming in the New Year – already it’s been a very eventful month for me… one that appeases the foodie in me too! I’m trying to make it a goal this year to enjoy more time ‘outside’ of my home… whether that’s at the community garden, or by the river reading, hiking or picnics in the park – but most importantly ‘date nights’ (or days) are going to be a big factor this year… spending more quality time together – we were both sick a lot last year so catching up regularly wasn’t always possible. 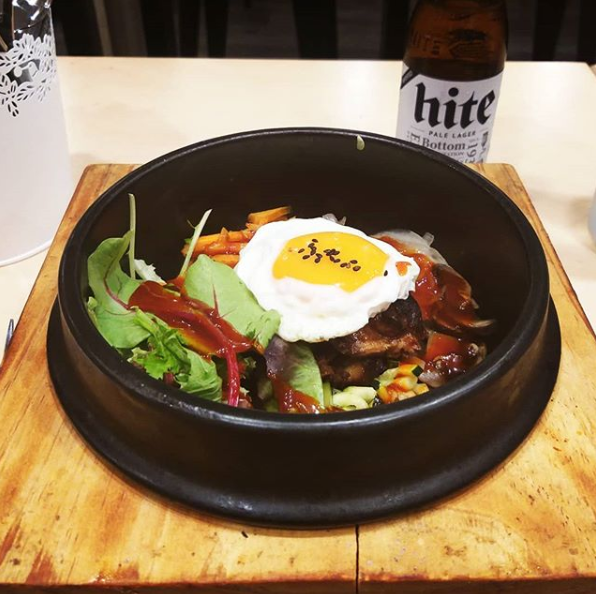 We recently decided to explore the restaurants and cafes closer to my home, and ended up deciding on Bistro Korea as the place for dinner on this occasion. It’s a quaint little eatery in the heart of Coorparoo Square, with a large screen playing K-Pop music charts in the background whilst you eat (I recently discovered a channel similar to it on my TV – I haven’t had access to TV in a LONG time so wasn’t even aware of new channels popping up – so it was a pleasant surprise to discover that I was already familiar with a few of the songs playing on the screen). They offer a selection of Korean dishes such as Dolsot, Korean Pancake, Toppoki (Rice Cake), Korean Noodles and for those who prefer something a little less adventurous, there’s Grilled Beef/Pork/Chicken with Rice, a variety of Korean Deep Fried Chicken to choose from or a Korean Salad. I opted for the Chicken Bibimbab in Hot Stone Bowl (Dolsot) which consists of soy chicken, carrot, zucchini, beansprout, lettuce, seaweed and egg, dressed with sauce. At only $15 it was a delicious meal that went down a treat. The chicken was superbly cooked, and the range of flavours and textures delightful to eat. 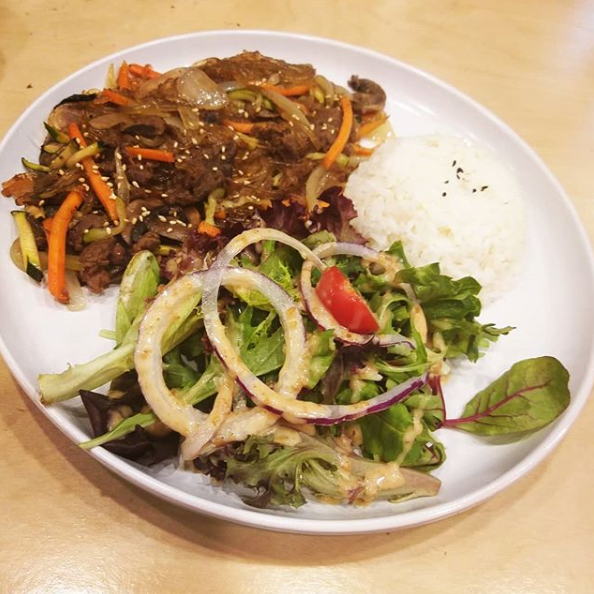 My partner opted for the Korean Noodles which consisted of beef, clear sweet potato noodles (also known as Bulgogi Japchae), onion, capsicum and rice. He seemed to really enjoy the meal (finishing long before me!) and also priced at $15 it was yet another affordable meal. Bistro Korea is a great little gem of an eatery, with seating indoors consisting of long benches with cushions and intimate little booths, as well as dining outdoors available. The staff are friendly and attentive and the restaurant presentable and cosy with the minimalist appeal – the focus is on the food and socialising over your meal. Good news for the lovers of fried chicken wings too – they recently introduced a Chicken Wing Buffet for only $21.90 ($12.90 for children under 10/Free for children under 3) – with 8 different flavours to choose from – it comes with chips, Korean radish and iced lemon tea. I’ll be back to sample that menu soon myself!